Judd Batchelor, who some may know through her drama workshops in Hackney schools, wrote and performs this exploration of grief and consolation with direction by Susie McKenna. It doesn't seek to diagnose the rash of teenage murders which London, Hackney included, has experienced recently. Instead it aims to empathise with the emotions of mothers who've had sons taken from them. A short piece playing in the Empire's studio, it depicts both proud nostalgia and dark rage. The words some of them left in a comments book afterwards showed that the drama touched a deep chord. It runs until 3rd February. "The case I had heard about concerns the culvert, formerly a brook called the Moselle Brook, flowing into the Lea from the area called Markfield Recreation Ground, in the South Tottenham ward of Haringey. A spokesperson for Thames Water told me that of the 30,000 households served by this drain, an estimated 10% had been wrongly plumbed in, so that sewage was entering the river on a 24-hours a day, all-year basis. The thing you need to understand is that whereas most of London, including Hackney, is served by a combined drainage system, the system in Haringey has separate drainage for sewage and other dirty water, and for rain run-off from roofs, gardens, roads, etc. This run-off drainage is piped into the river. But people have been connecting sewage pipes to this storm drain. The irony is that a system that was meant to make London, the Lea, and the Thames cleaner, is now making it dirtier, because it has been abused. I am told there is also sewage coming into the Lea from further up, from Pymme's Brook in Edmonton. I think you can find this in the A to Z. A year ago, someone who has been trying to deal with this problem for some twenty years was told that it would all be cleared up in six years. Presumably, this sudden urgency is because of the Olympics. If it's true, it means the problem will be sorted out within the next five years." Nigel adds that he thinks there was some TV coverage of this issue quite recently, featuring the resident of one of the narrow boats or barges docked near Springfield rowing club. If this rings any bells or anyone else knows anything more, please get in touch. I know the Gazette is interested in this story too. "London Borough of Hackney has appointed LDA Design and Jacobs UK to cost manage and deliver a £7 million upgrade of Clissold Park and House in North East London. Hackney won £4.5 million funding under the Big Lottery Fund Parks for People programme, based on a masterplan by Land Use Consultants, last year." 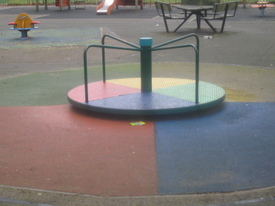 On 6th January I posted about The Shabby State Of Millfields Swings. I later brought it to the attention of the Council press office. Then, last Friday, I was impressed to find that Jules Pipe, Hackney's Mayor, had posted the following comment. "I was very concerned to read this post. I have been assured that the park rangers have thoroughly swept the site and removed the tufts of grass between the surfaces. The moss was removed by jet washing on 16th January. 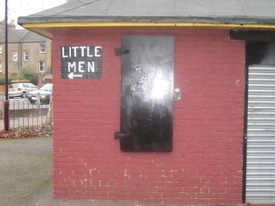 As soon as the weather dries out the Council will start on work to paint the toilet block to remove the offensive graffiti, and the rangers have made a start on the removal of graffiti on the play equipment." 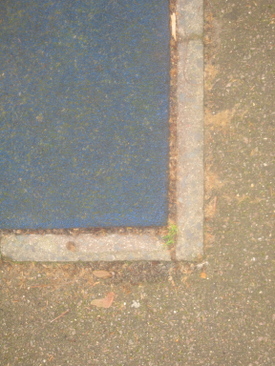 Yesterday morning I returned to the swings, camera in pocket, to see for myself. I was disappointed. 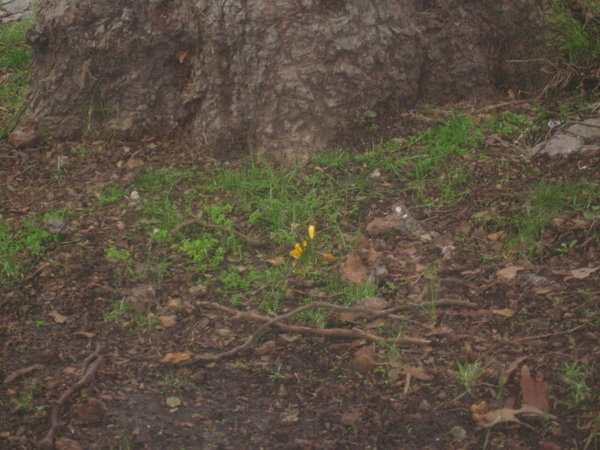 You can see from my photos that those tufts of grass have indeed been tackled - well, most of them - but if any moss was removed the evidence for this was not obvious. 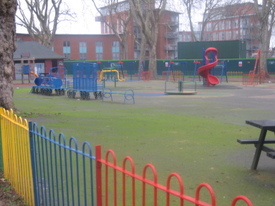 My new long shot of the play area shows the same carpet of green on the tree side as before, while the soft area around the roundabout was still treacherous. My fourth photograph shows the shutters on the toilet block. I'm not sure if these have been freshly re-painted, though they look as though they might have been. Perhaps that is the start of the graffiti removal Jules was referring to, which would be something. In general, though, the account of the clear-up the Mayor passed on to this blog only partly tallies with reality. "I would also like to take this opportunity to say that we do take complaints we receive very seriously and aim to resolve them as quickly as possible." I'm afraid it's over to you again, Jules. "A ceremony to commemorate Holocaust Memorial Day has been held at Hackney Town Hall to mark the liberation of Auschwitz concentration camp in 1945. The ceremony was also aimed at remembering the victims of more recent genocides and discrimination. It was led by the Speaker of Hackney, Councillor Faizullah Khan. He said: 'Holocaust Memorial Day provides a focus to think about the continuing repercussions of the Holocaust, more recent genocides and the issue of exclusion within our society. It is intended to encourage everyone to remember the victims of the Holocaust, of all Nazi racial and social persecution, more recent genocides, and of discrimination and hate crimes in Britain today.'" Very moving. Very Hackney. Read more here. "Dalston has just got a new branch of Tesco. It only opened today, and as I was passing anyway, I stepped inside to take a look. It’s only one of the convenience store format versions, rather than a full-on superstore; but it’s handy and it’s open late, so I’ll probably be doing my mid-week fresh fruit and veg top-up shop there from now on. For many years, anyone in this part of London without a car - and that’s most people around here - has pretty much been dependent on the large Sainsbury in Kingsland shopping centre. Grumbling about the place is a staple of local bus-stop small talk." Now read on here or here. The Mayor is concerned that we won't benefit long-term from the media centres to be built for the Olympics unless media companies are involved in drawing up the plans for them. He's been telling the Culture, Media and Sport Select Committee about it. More here.